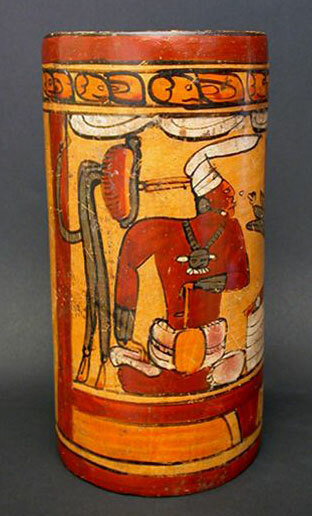 This tall Mayan polychrome vase depicts a cross-legged ruler seated on a raised dias, looking over his left shoulder toward two kneeling suppliants, a coiled vessel or basket with feathers nearby, swagged curtains below a band of glyphs around the rim, and an enclosed grouping of three glyphs in the field near the seated ruler, perhaps naming him; painted in dark brownish orange, pale orange, black, white, gray and pink, on a pale orange ground. Property of the Munson-Williams-Proctor Institute, Utica, New York, this vase was acquired in 1968 from Andre Emmerich, New York. The Accession Number is marked in red on the reverse side: "MWP 68.77". This object is sold with a report on Thermoluminescence Authenticity Dating by the distinguished Daybreak Archaeometric Laboratory Services, Guilford, CT. Condition: Three larger breaks and approximately eight smaller breaks have been professionally rejoined. In addition, there are two very small areas of restoration, one approx. 1 in. by 1/4 in. on the base, and one approx 1 sq. in., with minor inpainting at the second location. The vase is in otherwise overall good condition.